When I am not drawn to making fiddly patterns, I love one-block quilts like this. 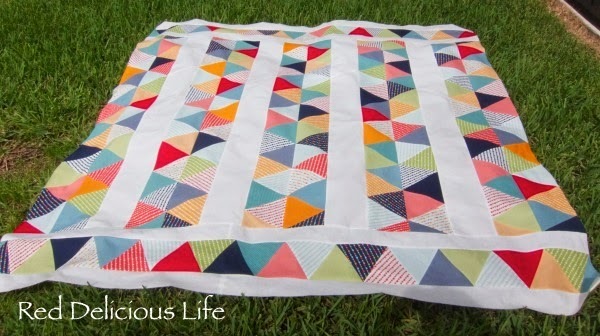 I never thought to add borders to my triangle quilt, but what you have done is so effective! Lovely! The addition of the white sashing was a wonderful choice. I really like how it breaks up the colors and give you time to focus on each grouping. This is beautiful! I love the layout and your triangles look perfect. what a great pattern for the triangles! wonderful fabric choices. 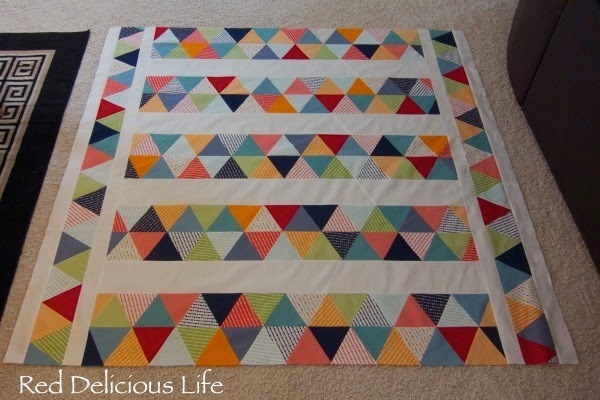 Great design, love the white sashing: it makes all the triangles really pop!! I agree with the white sashing! It broke it up nicely :) Also love the colors you chose, so bright and fun. What a beautiful, prismatic effect your Triangles on Parade have Diana! I too love how you put it together with the white strips! Thank you for sharing this on Let's Bee Social! Looks great laid on the bed like that - lovely and bright! Very nice. I love the name Triangles on Parade! Beautiful quilt! I love the rows that go the other way! Triangles on Parade, absolutely! The white sashing is beautiful and I love the borders. What a great use of leftover rows. I love the white sashing! 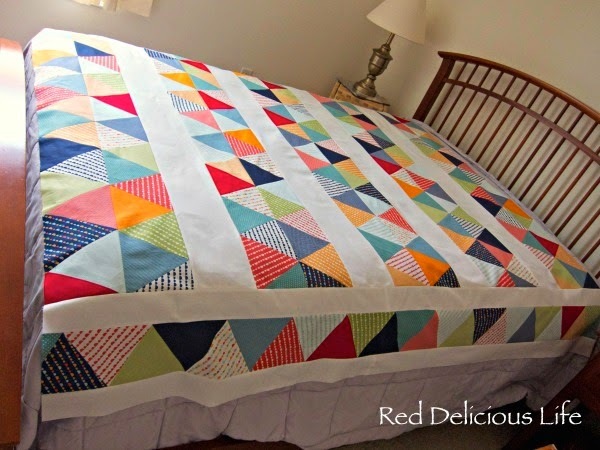 It turns it from a great quilt to a gobsmacker! Lovely fabrics you've used too. I love your quilt top. The colors are so fun and vibrant. Gorgeous! I love this, the layout and sashing look great. Genius! Love the addition of those sashing pieces and the side borders.... Especially in white! Pow! Looks fabulous, Diana!